Pros: The Greek yogurt sorbet is as luscious as its thick, rich inspiration; a dark chocolate version has the dense intensity of a Swiss bar; huckleberry is just like the fruit—all creative and delicious. But that’s not the end: There’s sorbet for dinner, too (shrimp is served with carrot sorbet and oysters come with a celery version). $12 for five scoops. Cons: Sorbets are made without stabilizers, so they melt fast. Pros: They don’t just go for the obvious at this nuevo Latino. Morir soñando, with rum, lime, orange, and a splash of milk, is a semi-solid cross between a dessert and a tropical cocktail; passionfruit and lime sorbets are properly tart, coconut is creamy and smooth. And you can just sit at the bar and order a few with coffee. $8 for three scoops. Cons: Apart from the morir soñando, Ola’s creative efforts (like bitter, foamy beer sorbet) fall flat. Pros: We’ve sampled loads of imported sakes at this fun spot, with its gold-leafed wall and chopstick-decorated ceiling. Now, as a twist on dessert wines, Yujin offers sake sorbet. One is blended with white peaches, another with litchis; both can be ordered floating in a melon soup, a perfect naturally sweet conduit, or alone. $7 for three scoops. Cons: The sorbets are a touch too sugary for our taste. 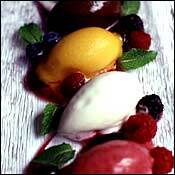 Pros: The house specialty, “ten flavors sorbet,” is a blend of, yes, ten fruits and spices. It’s served with cool, tasty sides: a chocolate cone, tapioca pudding, and mango ravioli. The fromage blanc and lime-rosemary versions are far superior. $8 for three scoops. Cons: Ten flavors are too many in one scoop—the result tastes somewhat bitter. Pros: The bar area and its tables are a great, romantic dessert spot with flattering lighting. Attractive, inventive flavor combinations include blueberry-and-lavender sorbet. $8.50 for three scoops. Cons: The sorbets are over-aerated and candylike: You taste the sugar before you taste the fruit. Pros: Pastry chef Jehangir Mehta is known for savory sorbets like passionfruit-marjoram, but he also has tasty dessert versions: coconut spiked with Malibu, and pineapple (the fruit is roasted for extra flavor). $7 for three scoops. Cons: Mint sorbet is a good idea, but here it’s too sweet. More flavors would bring this up a star. Pros: The sorbet pyramid is like a giant fruit sundae, with cantaloupe, honeydew, berry, piña colada, blueberry, lemon, litchi, cherry, passionfruit, mango, and plum, all served on a block of ice with peanut-butter cookies and homemade marshmallows. The sorbets have a nice balance of ice and smoothness. $12. Cons: The pyramid cries out for one or two more exotic entries. Inspired? Freeze your own sorbet with an ice-cream maker and a few tips from Ciao Bella president Charlie Apt. 1. Use slightly overripe fruit. It imparts more flavor. 2. If you are using a fresh herb like mint, soak the sorbet mixture for 24 hours so the flavor will be fully infused. 3. Use a pre-chilled glass so the sorbet doesn’t melt when it is scooped in. 4 . A touch of wine or vodka adds a little extra flavor and changes the texture by lowering the melting point.